Just behind the team uniforms, the next most critical touchpoint of the organization’s identity was the team web site, which I also designed and coded. As it was my first major foray into Flash, the concept of the site probably outshone the rather clunky execution. I know enough about Flash to elucidate an idea, but not enough to “optimize” the experience as specialist programmers can. The layout is a bit dodgy in some regards as well. Nevertheless, the site brought the dynamism and personality of the team to the Internet within the context of the sponsored team identity concept. Here, too, the hands of Ashmead College emerged from the grid. The dynamic visual hook here was that the hands would actually move across the screen to “massage” the site from one page to the next. In addition to the layout and interactive execution, I also developed and wrote most of the content, including pithy, spirited interviews of team members that brought the individual personalities out of the uniforms. Over the years, the team identity concept was indeed tested, as other lead sponsors were considered—everything from wineries to gyms to car dealerships—and we illustrated these possibilities in various mockup sketches as part of the proposals. I won’t show these online, as I wouldn’t want to jeopardize these professional relationships. Imagine, though, for instance, in the case of the winery, vines of grapes or a hand toasting a goblet emerging from the grid; web pages being poured into the site. The possibilities, as they say, are endless. 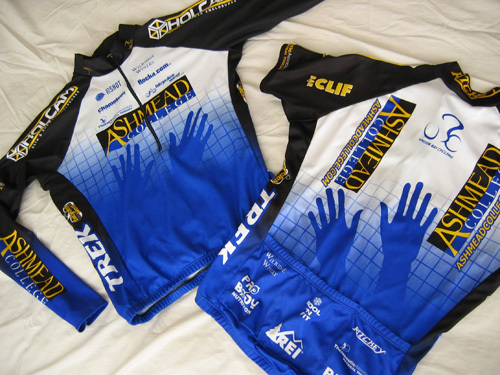 But, as long as I was involved with the team, the Ashmead massage school (and their hands) remained committed to the team, which was great, as they were more than just a name on the jersey; they were highly engaged in realizing the mutual promotional and educational potential of the partnership. As a case in point, one element of the relationship provided for the racers to be worked on weekly by the massage trainees, which, in itself, proved to be valuable experience for both groups. 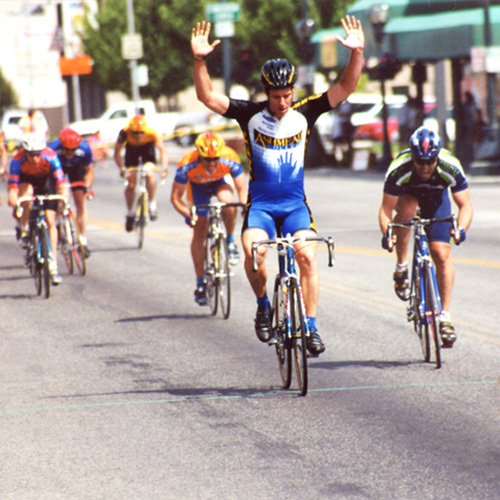 Moreover, the Ashmead jersey is probably the only racing uniform that allows racers to raise more than just two hands after a well-deserved victory. This was quite interesting, especially the info on how sponsors fit within a pre-established grid based upon their commitment to the team. I always wondered how that worked. I suppose NASCAR has a similar grid-based structure. Now that you’ve lived in NYC for a few years, have you finally joined up with another racing team yet? Indeed, NASCAR (and motor racing in general) is another sport based on the sponsorship model. I think the origin of these relationships probably had a lot to do with the equipment factor; race cars and bikes are really expensive and, of course, integral to the respective sports, and, if you look in the archives, you’ll see that most teams were originally based solely on their equipment suppliers. Of course, the sponsorship requirements of both sports have expanded and diversified immensely since their simple dawns. And, yes, I’m sure you can bet your bottom sponsor (the one with the 2 inch decal just behind the rear fender) that NASCAR teams have every micron of those cars spec’d out for exact pricing. The hands moving across the jerseys are obviously meant to represent the massaging hands of the sponsor’s academy. The grid, too, can be read as the Japanese-style screens common in the massage studio. Or, maybe it’s just a poor soul in a grid. And, as you allude to, I was not only the designer, I was also a member. And, yes, I ended up racing with a really great team here for a couple seasons. But, sadly, I haven’t had much time or interest in the atrocious NYC racing scene lately.